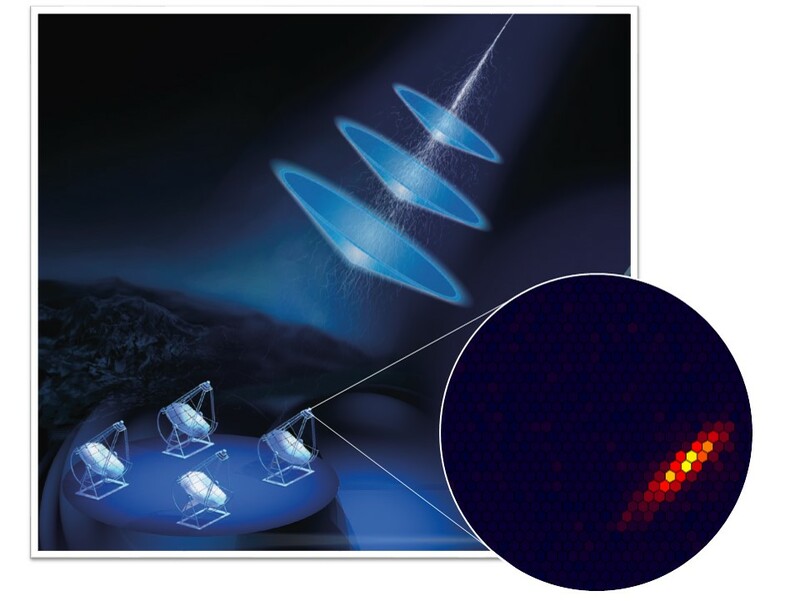 CTA detects the Cherenkov light produced by particles in the electromagnetic showers resulting from gamma ray or cosmic ray interactions in the atmosphere. Each telescope of the arrays has a large mirror that reflects the atmospheric Cherenkov light toward a camera made of more than a thousand photomultiplier pixels. The shower direction and energy are reconstructed by combining in stereo camera images from multiple telescopes. Each photomultiplier amplifies from a few up to a few thousand photoelectrons during a few tens of nanoseconds, and during that time the night sky light and electronic backgrounds produce and additional intensity of about 1 to 10 photoelectrons per pixel. The challenge is to reconstruct all shower images at the precision level that allows for disentangling the cosmic ray background from the gamma ray astrophysical signal as well as getting the sharpest sky images. The capacity to reconstruct the shower image characteristics depends on the background power rejection or “cleaning”, in particular for faint showers. In traditional cleaning methods, the signal is selected from the brightest pixels with two thresholds. The first threshold p1 (in unit of photoelectrons) identifies the shower core. The first closest neighbours to this selected hit are then collected if their intensity exceeds a second threshold p2. With such methods, the pixel population with intensities below p2 is lost. Moreover, shower images with no pixel above p1 are not reconstructed. 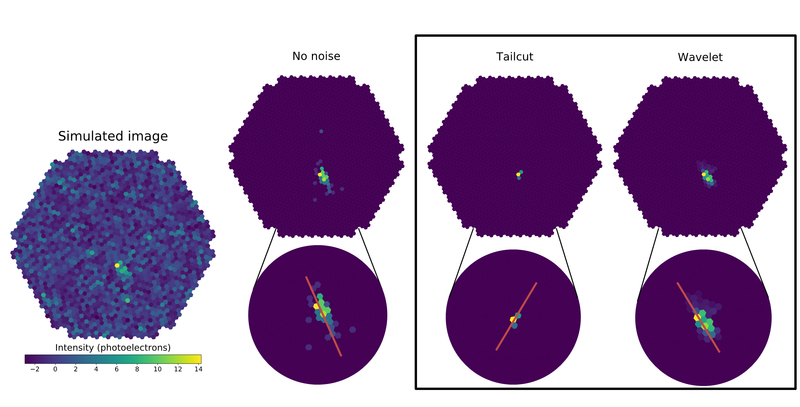 Based on the experience gained by the CEA Cosmostat group specialised in sparse methods applied to cosmology (Euclid) and radio astronomy (SKA), the CTA group of the CEA astrophysics division decided to investigate wavelet filtering for camera image cleaning. Wavelet filtering is particularly appealing: the signal can de decomposed in its various spatial scale components, the complete shower image can be extracted down to the lower intensity pixels and the faintest images are not rejected. Moreover the underlying background intensity is intrinsically subtracted, a feature absent from the usual methods. Studies done on CTA simulated data have shown that wavelet filtering give better direction and intensity estimates in all the camera type of the telescope arrays. The atmospheric Cherenkov detection principle. A gamma ray interacts in the atmosphere at an altitude of about 15 km. It creates a shower of particles propagating at nearly the speed of light, thus leading to the emission of a thin bluish conic light beam, known as Cherenkov light. The light propagates to the ground where it illuminates a telescope mirror reflecting the photons to a camera consisting of a grid of photomultiplier pixels. Image credit: Thierry Stolarczyk (CEA). Example of a faint shower image cleaning (Gamma ray of 100 GeV in Nectarcam). From left to right: the simulated image, the image without noise, the result of the double threshold cleaning (p1=10, p2=5) and the wavelet filtering. The red line shows the shower direction estimated from the available information. Image credit: Thierry Stolarczyk (CEA).